wiki.yandex.com is the main Wiki page. The main page usually lists the main Wiki sections, important links, or news. 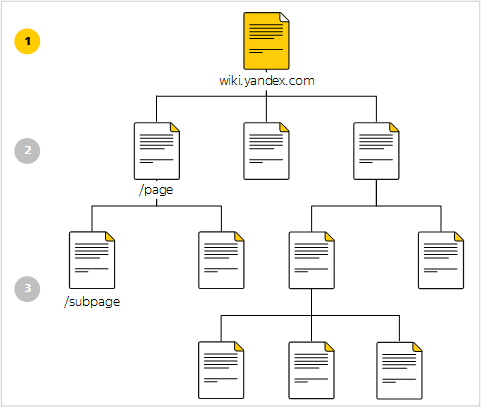 wiki.yandex.com/page are top-level pages. These pages are usually dedicated to major areas, such as departments, teams, or projects. Note. The main page is not a parent of the top-level pages. 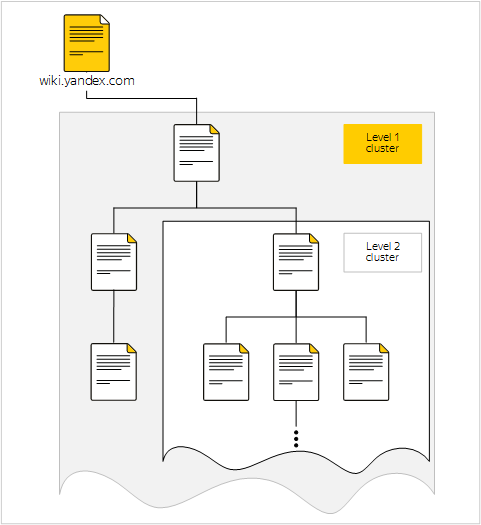 wiki.yandex.com/page/subpage/... are pages on the second and subsequent levels. Each page has an owner who can manage page access. By default, the owner is the person who created the page. The name of the owner is shown under the page title. A cluster is a page and all its subpages. Pages in the same cluster usually share a common subject. Each Wiki user has a personal cluster (wiki.yandex.com/users/userName). You can store personal information, plans, drafts, and other texts in your cluster. Click My cluster on the Wiki header to navigate to your personal cluster. By default, the pages in your personal cluster can be accessed by everyone. There is a private notes cluster located inside your personal cluster that is hidden from other users (wiki.yandex.com/users/userName/notes). You can create notes in two clicks from any Wiki page. Click Notes on the Wiki header to navigate to your notes cluster. As with other pages you own, you can change access settings for pages in your personal cluster and the notes cluster.